Secure the transport of IP data with ENENSYS’ IP reliability solutions. Manage automatically & efficiently the failures in your system and cope with IP network transport relative troubles using ENENSYS’ “Switches & IP transport” products. ENENSYS' switches enable to continuously check the data integrity on the outputs of your equipment (encoders, multiplexers, gateways, VOD server...) and to automatically switch to backup if any error is detected keeping your system up and running. ENENSYS' switches enable seamless switching capability between IP streams coming from the same sources and transported through different IP paths. If network error occurs, seamless switch-over is performed, making network failures totally transparent for any equipment downstream and the final customers. ENENSYS' provides the right products to cope with problems inherent to the use of IP network links. Using ENENSYS' products, jitter, packet losses and network failure are properly managed and do not matter anymore. According to your needs and the complexity of your infrastructure, ENENSYS' provides convenient solution with the right processing capability. The solution capability can be increased following the growth of your needs. ENENSYS’ IP switch can select the best of incoming IP streams. The selection is based on a set of configurable criteria. The switching can be done either at the stream level or at the interface level. ENENSYS’ solution fully support ETR290 as switching criteria. It also provides a set of conditions to fit the customers needs like audio & video bitrate, list of PIDs presence as well as network links performances. ENENSYS’ IP switch can resynchronizes identical streams transported over links with different propagation delays. 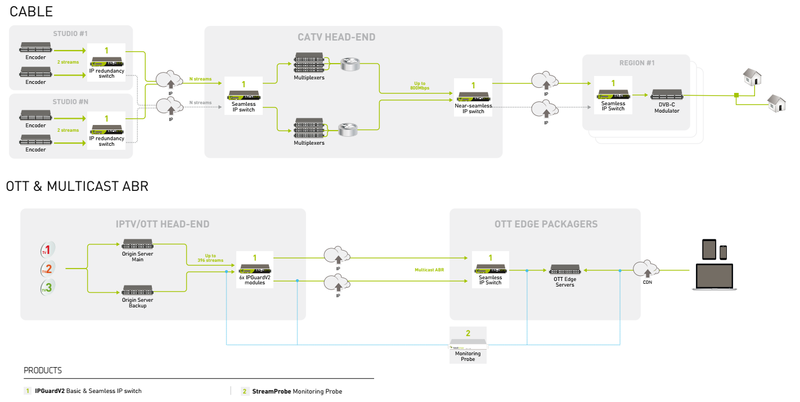 That allows to perform seamless switching when network troubles occur, ensuring the integrity of the streams. ENENSYS’ IP switches support SMPTE2022-7. ENENSYS provides high density switches allowing to manage big number of streams. That allows the switches to be integrated for instance into CATV and/or IPTV infrastructures.